There are some chemical elements that are inherently toxic and which for centuries insidiously affected human affairs by their widespread poisoning of the home and the environment, sometimes killing even the high and the mighty. Meanwhile less exalted people deliberately used them to dispose of unwanted individuals and, until chemical analysis became part of forensic investigation, they murdered with impunity. Arsenic, antimony, mercury, lead and thallium are the most infamous of the poisonous elements, and even today they still threaten the environment. Inspiration, passion, murder! I have always been interested in the ultimate crime, and particularly when the murderer has used a chemical method of killing in an attempt to escape detection. This book, which is devoted to the darker side of the periodic table, was originally proposed as a series of five books continuing as a series starting with The Shocking History of Phosphorus, and then continuing with The Shocking History of Arsenic, The Shocking History of Mercury, etc. However, I was advised that there would not be a readership for such a series and that it would be better to combine these into a single volume. The main chapters deal with the toxic metals mercury, thallium, lead, arsenic and antimony. Other less toxic elements are include in a final chapter, including some surprising ones which are normally thought to be safe but can be deadly. 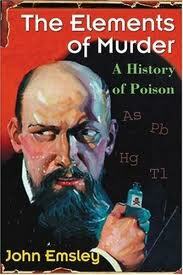 You can buy The Elements of Murder: A History of Poison from Amazon.